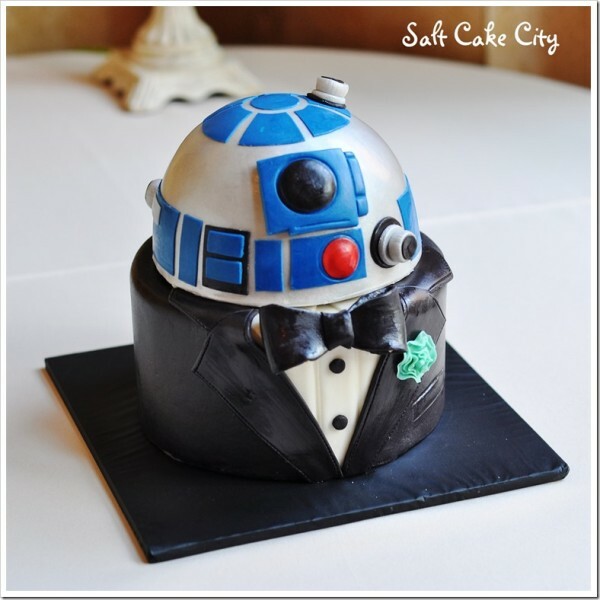 This R2-D2 groom’s cake is a real class act. You might call him a Class-tromech droid all dressed up in his finest attire. Honestly, I’ve never seen R2 looking so distinguished. The folks over at Utah-based Salt Cake City bakery created this amazing cake. R2 is covered in ‪‎marshmallow fondant with a ‪satin ice ‪sugar flower & ‪‎bow tie to match the ‪‎wedding colors. It almost makes me wish we could have seen the droid in a suit in one of the movies. I guess if George Lucas had made another Star Wars movie, we might have seen some weird stuff like that. Thank God that never happened. This cake is something the happy couple will remember forever.